I’ve still got S’mores on my mind, and these S’mores Sandwich Cookies are made with charred, gooey marshmallow fluff and a thick layer of dark chocolate sandwiched between two soft and chewy graham cracker cookies. 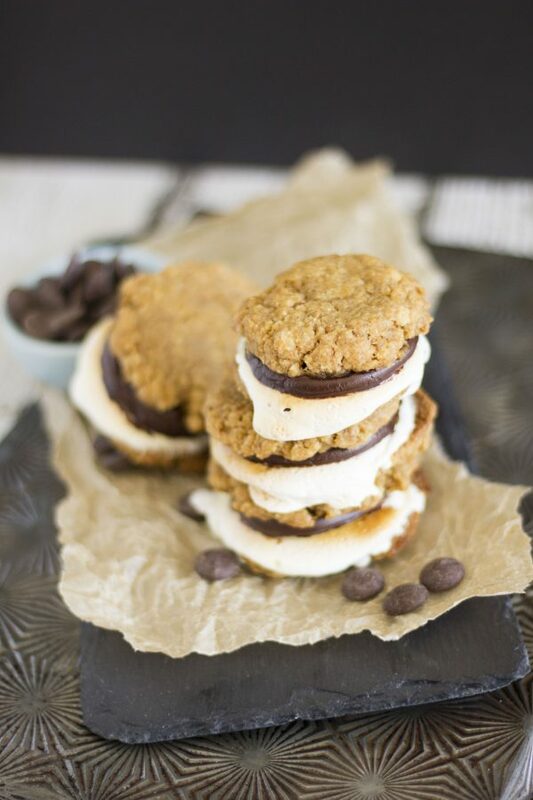 It’s the best of a homemade s’more packed into a satisfying sandwich cookie! I know some of you out there are getting ready to go back to school. Not us. My kiddos got out of school the last week of June. Yup. The. Last. Week. Of. June. So that means, we still have about three weeks of summer left. Woo hoo! We don’t head back to school until after Labor Day. Seriously though, I’m not sure how I feel about that. I mean, I think I’d rather start school earlier and end earlier, but it’s beyond my control, so I’m just gonna let it go. Since we are technically still in the middle of our summer, we’re still in full-on-s’mores mode. And we’re indulging with these S’mores Sandwich Cookies. The cookie part of these S’mores Sandwich Cookies is made with crushed graham crackers instead of all-purpose flour. It adds graham cracker flavor and a chewy, oatmeal-like texture. They are delicious. The cookies were almost all eaten before I could put these S’mores Sandwich Cookies together. I had to make a second batch of cookies because half of the first batch mysteriously disappeared before I could assemble the s’mores. What’s inside these bad boys? Well – marshmallows and dark chocolate ganache. So my original plan was to make homemade marshmallow fluff, but then I decided to go for the jarred stuff. Sometimes you want to have a S’mores Sandwich Cookie without too much fuss. So, jarred marshmallow fluff it was. And for the chocolate, I decided on a dark chocolate ganache. I wanted something with a little more body to add to the marshmallow fluff, and let’s be honest, nothing beats a luscious ganache. Why dark chocolate? Well, I felt like it countered the uber-sweet marshmallow fluff. But if you like semi-sweet chocolate or milk chocolate, go right ahead and use that. These S’mores Sandwich Cookies couldn’t be easier. Cookies made with crushed graham crackers, marshmallow fluff, and dark chocolate ganache. So perfect and so satisfying. 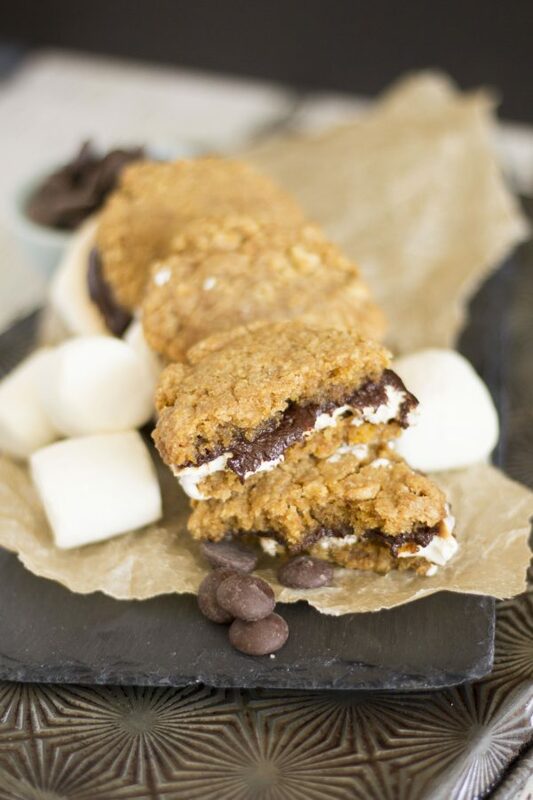 These S'mores Sandwich Cookies are made with charred, gooey marshmallow fluff and a thick layer of dark chocolate sandwiched between two soft and chewy graham cracker cookies. 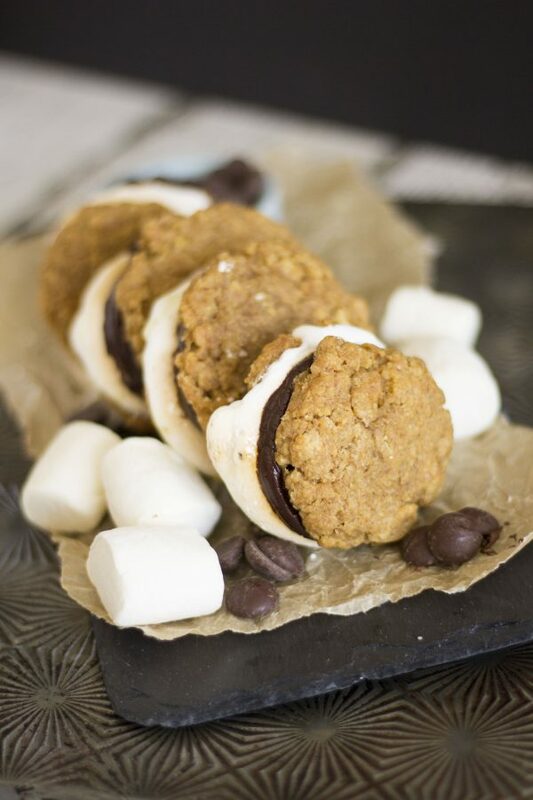 It's the best of a homemade s'more packed into a satisfying sandwich cookie! Pour over chopped chocolate, and cover with an air-tight cover for 10 min. Set aside, and allow to cool until thick and spreadable. 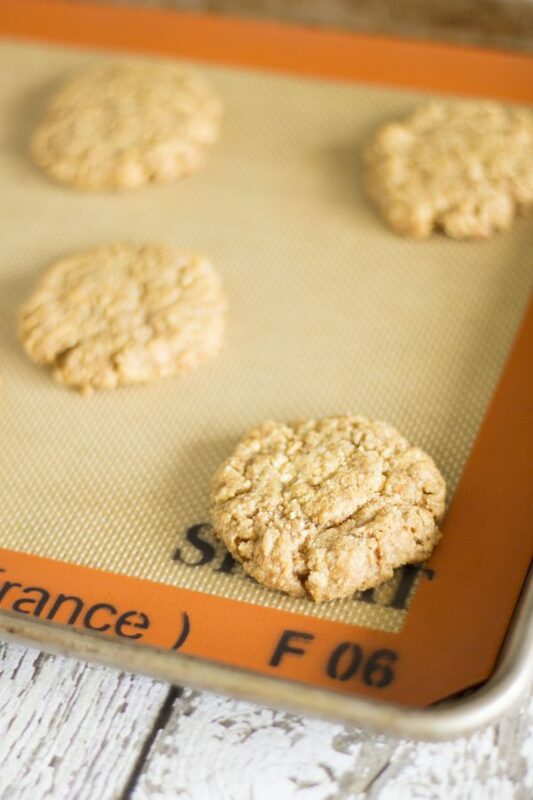 Preheat the oven to 350 degrees F and line a baking sheet with parchment paper or a silicon baking mat. Crumble the graham crackers into fine crumbs by either placing them in a food processor or by placing them in a plastic zip-top bag and smashing them with a rolling pin. Transfer the crumbs to a large bowl. Add the sugar, brown sugar, baking soda, and salt to the graham cracker crumbs. Mix until just combined. Add the butter, eggs, and vanilla. Stir with a rubber spatula until just combined into a dough. Roll walnut-shaped balls and place them on the prepared baking sheet about 2-inches apart. Bake for 10 min then remove from oven. Flatten the cookies with the bottom of a small drinking glass. Return to the oven and bake for an additional 2-3 minutes. 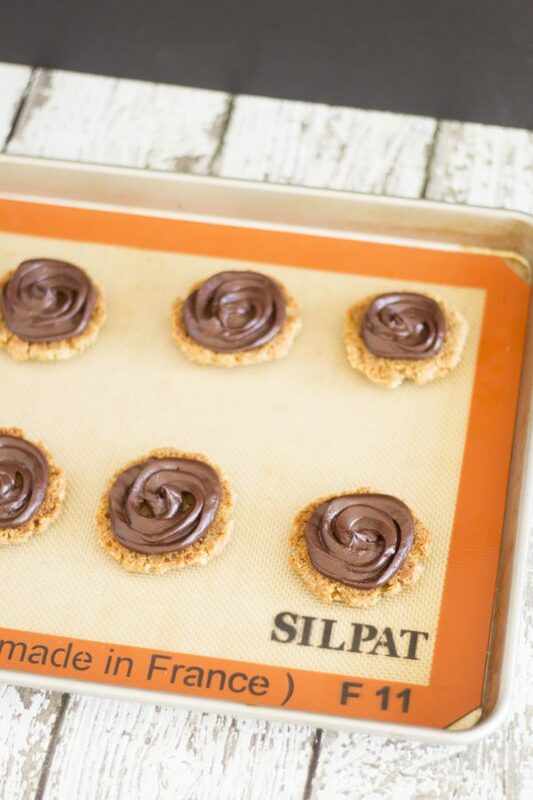 Remove the cookies from the oven, and allow them to sit on the cookie sheets for an additional 10 min. Then remove the cookies to a cooling rack and allow them to cool completely. Placed chopped chocolate in a bowl. Place half of the cookies, face side up on a parchment lined baking sheet. Place the thickened ganache into a piping bag. Pipe the ganache on to the cookies. Place the other half of the cookies, face side up on another parchment lined baking sheet.On this batch of cookies, spread about 1 heaping teaspoon of marshmallow cream. Allow the marshmallow-topped cookies to cool about 2 to 3 minutes before proceeding. Once slightly cooled, place ganache covered cookies on top of the marshmallow ones. Refrigerate for about 15 to 20 minutes. Then enjoy! 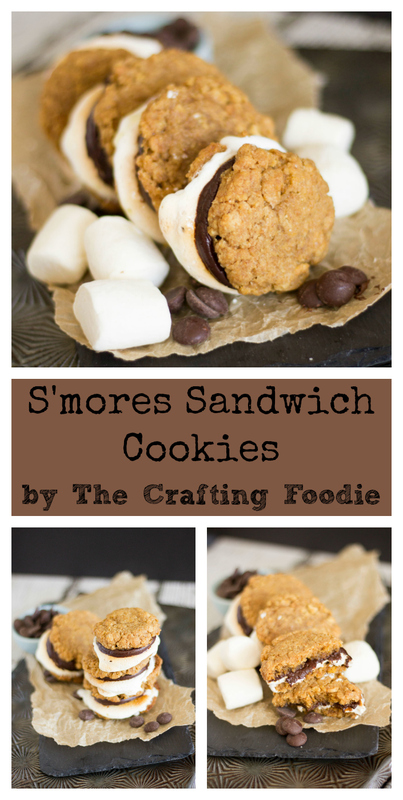 I love smores ANYTHING so these look beyond amazing! Pinning! These look incredible. Anything with graham crackers and chocolate is delicious. Thanks so much, Kristen! Graham crackers are the most underrated cookie/cracker. Add chocolate to that, and it’s perfect! How fun! Perfect for the fall season! I really like anything to do with smores and these look amazing. I am going to have to try them. Thanks for sharing! I love s’mores everything! I’m pinning this to try to make them soon! Thanks, Stephanie! I know – s’mores are always delicious. Who can resist all of that goodness? Yummm! These look incredible. I love how you used thick cookies instead of graham crackers. I bet they’re super gooey and chewy! I am loving Smores. I will definitely try this for my family. I love them too! I hope you give them a try 🙂 My friends and family LOVE them!